Well Guys! Best part of your life is the college life. I still remember my college life, we enjoyed every moment of it. Let it be, hostel, college canteen or even classroom, we had fun with our friends every single moment. At that point of time no one was serious about their future, we were just having good times. But as we were approaching 7th and 8th semester, slowly we started growing concern about our future and career. Reality is, your future will totally depend how well you do in college. Whether it is your academics or other co-curricular activities, your last year would be very crucial. You will live your rest of life happily if you choose a right job when you are in college. So what would be a right job for you. Off Course! I would say a Government job. But why a government Job Only? Why you want to go for government jobs when you are studying in college. In your campus many MNC companies will come to recruit fresher. They offer a great salary but why only a Sarkari Naukri. More Money Under the Table. Just check this link to read all these benefits of Sarkari Naukri in details and find out why you should prepare for government jobs from right now. Why You Have to Prepare From Now On? If you start from now on, then by the time you complete your degree, you will find very easy to get a government job. As I said government jobs are the best however to qualify you have to start preparing from the very beginning. Right now in college you get plenty of time, although you have lot to study but still you will be able to get enough time. But as you graduate, you will lose this precious time because in college you are very energetic and your learning power is lot more developed. You can catch anything quickly. I will talk more on personality later in this blog. But one thing I want to tell you right now about personality that it is a thing that cannot be acquired over night but you have to work for years and years. You will find later that how personality is important if you want to succeed in your career. So to develop personality you have to start from now on. In college, there is an encouraging environment if you want to learn something new. There are friends, seniors and professors who are ready to help you all the time. After coming out from college, you would not find that type of encouraging environment. Before I tell you how to prepare for government jobs while you are in college, first you have to know what actually you have to prepare. Well! Mark these words, to get a sarkari naukri you need to have a great personality along with academics. You have to do well in academics but you will never get a top class government job unless you have good personality. So work on both aspects: Academics as well as persona. Always give importance to your studies. It does not matter from which discipline you come from. Whether it is engineering, B.Com. Arts, or any other degree, try to score distinction, above 60% in your studies. Take every semester seriously, do not leave anything for next semester. To get any type of good job, not just government job, your performance have to be good in academia. Well! As I said earlier in this article, personality is not something that you get overnight but you have to develop in years. Again mark my words, a candidate for a job who is not good in academics but has a great personality is better than a candidate who is excellent in academics but with no personality. Personality is a huge area and i cannot cover in just one or two paragraphs. So, you can read more about developing your personality in our future blog posts. There are many but these are few of them. In next section I will show you how you can develop these attributes while you are in college. 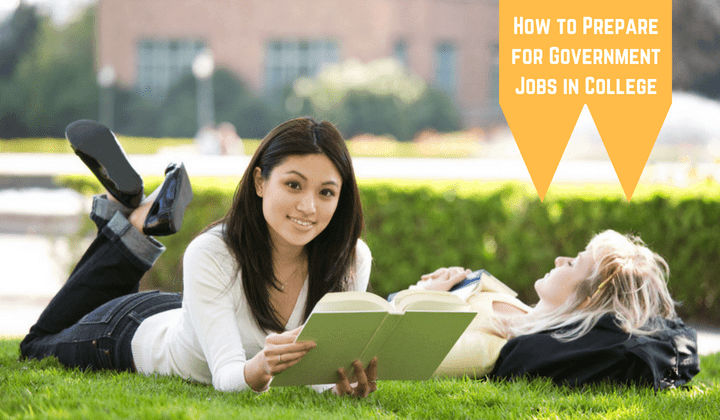 Now the main part of this blog post, how to prepare for government jobs while you are in college. You have to study hard for giving good performance in academics, but to develop personality you have to work from now on. You can have academics but having a great personality is very rare and it is personality that is going to distinguish you from rest of the candidates. As I said earlier personality is more important than academic qualification because it takes time. So start developing it, while you are in college. I will tell how you how can make best use of your college life to develop your personality and get a top class Sarkari naukri. Hostel room in a college can teach you how to do a work in team. You have to learn to adjust with your seniors and colleagues. If you are in need of something that is very urgent and important then your friends might help you. This makes you totally humble and down to earth kind of man. In hostel, learn to develop teamwork skills that is good to develop your personality. In your classroom you can develop the most important attribute of personality and that is leadership. You should take lead in your classroom. Always present yourself whenever professor or lecturer wants to lead you. Leadership quality you can learn from here. These attributes are needed to get a Sarkari Naukri. Develop a good sense of humor in your college canteen. In canteen while having a gup-shup with your friends try to look humorous aspect of life. You can easily clear an interview of a government job if you have good sense of humor and it can be developed right in your college canteen. Giving exams for every semester will teach you to be patient. Patience will be required to clear aptitude test for any government job. To solve problems for a government job exam you need analytical skills and for that you need to have patience. Hence college exams can teach you to be patient. Second is honesty if you do not cheat and pass exams on merits then you are honest. You have to face people with boldness and confidence. You can learn these attributes while taking part in college fest. If you can give speech or address a crowd in your college then you can face anyone with confidence. Boldness and confidence would be required for clearing an interview for a sarkari naukri. Knowledge will make you an ideal candidate for a government job. If you spent your vacations that you get after giving exams studying books of all types then you will acquire a lot of knowledge. Read books of all types, current affairs, literature, comics, mathematics, etc. Good knowledge on any topic would help you to stand out from the rest. Start implementing from now on, you will definitely get a Sarkari Naukri.